I am a member of Alpha Chi Omega, and of a digitally-based alumnae chapter, Rho Phi Rho, formed to support our local collegiate chapter, Gamma Omicron. You don't need to really know any of this, except I'm offering a group of handmade cards to the chapter in a silent auction as a fundraiser. I thought if you like cards, you might like to see images of them (the auction is for members of the chapter). This might be one of my favorite cards. I stamped the Penny Black Poppy Time stamp with Hero Arts black ink on Arches Cold Press watercolor paper. 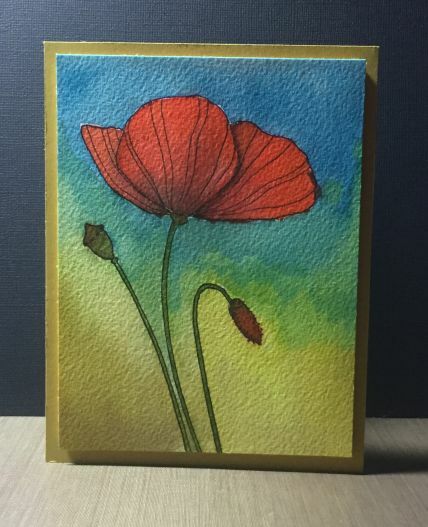 I painted the flower and background with Mijello Mission Gold watercolors. The panel is popped up on the card base with craft foam. 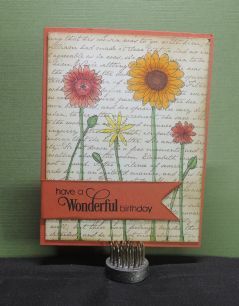 The card base is MFT Fuse green card stock - I never thought I would use that color, but it was perfect for this card. I wanted to highlight the "Look for the Miracles" sentiment from the Simon Says Stamp June kit, and I thought rainbow flowers would fit the theme. 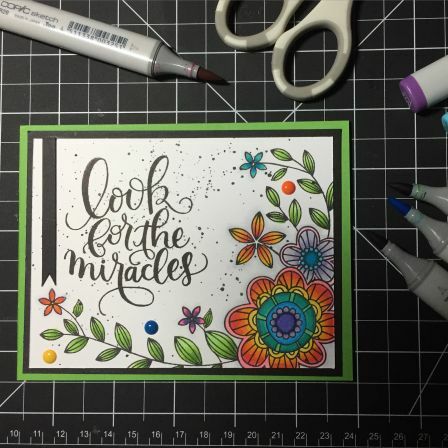 The flowers and sentiment are from the Look for the Miracles stamp set. I stamped the flowers (using masks) and then colored them with copics. I spent some time playing with colored pencils this week. 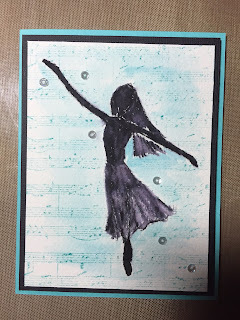 The card front to the right was made by stamping with Hero Arts black ink and using the stamps from the March My Hero Kit. I drew the stems using a black fine line sharpie (not my usual choice, but it was what I had handy). The paper is kraft paper from My Favorite Things. I colored the images using Prismacolor pencils. 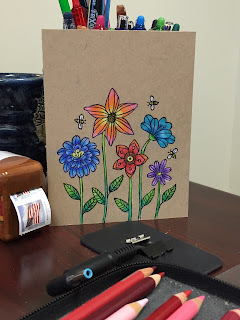 The normal way of coloring of kraft wouldn't provide vibrant color (I imagine), so first, I colored the flowers, stems and bees with the white Prismacolor pencil. I then added color with the colored pencils. Each image has two of three colors, blended together. I approached it with a Copic mind set - adding the colors, blending, then adding the colors again - from yellow to orange to pink, and then orange to yellow. That seemed to provide good blending. I then used the sharpie to add the lines back (obscured by the pencils). I like how it turned out. I'm not sure what kind of card it will be, but I imagine a sentiment at the top. We'll see what kind of card I need next - that will dictate the purpose. this past weekend. That's an occasion that calls for a card. I don't have any "dancer" stamps, so I attempted to put my tiny watercolors skills to use. I googled dancer silouette, and found an image that gave me shape. I wish I could find it again to link here - isn't that always the way? The image was only a shape - no hair, and a tutu shaped outfit. From that I sketched the shape on Arches Cold Press watercolor paper. I use a black zig real color brush pen to add black to the shape - not coloring it in, just adding some black. I added the skirt and hair. Using a wet brush, I painted in the shape of the silhouette from the black I had added. The background is watercolored with distress inks and water. I used the My Favorite Things musical score background stamp (Love this stamp - it's been out of stock, and I grabbed it when it returned) with Lawn Fawn peacock ink (I think) to stamp the music. 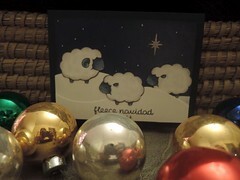 The card is mounted on MFT card stock. I can't remember the color, but it matches the lawn fawn ink pretty well. The sequins (which I'm not sure if I like on the card or not) are Pretty Pink Posh sparkling clear 4mm. She's not perfect, but that's OK. I like her. I haven't been posting regularly, but I'll see if I can change that. I thought it might be interesting to post cards that I make along with the inspiration for the card. Many of my cards aren't original designs - some are exactly like someone else's card, and a few others are variations of designs. It's the variations that I'm talking about. I made this one last night. I found it's inspiration on Pinterest --> this pin. I found it because I was looking for inspiration for a romantic script 6x6 stamp I purchased from My Favorite Things. This is the card I made. I didn't have the beautiful flowers from the inspiration, so I used instead Doodle Flowers from Inkadinkado. The doodle look to them worked well with my hand-drawn stems and buds. I stamped them on Neenah solar white with MFT black hybrid ink. I stamped the MFT Romantic Script stamp over the flowers with Lawn Fawn Walnut ink. I colored the flowers and stems with copic markers. I then "distressed" the white paper with Distress Ink - all over with old paper and then on the edges with vintage photo using a round blender. The piece is layered on MFT Tangy Orange. 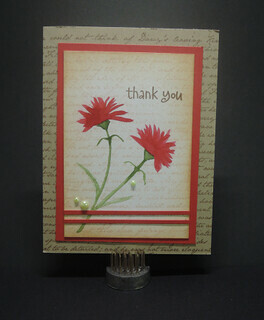 The sentiment is from Penny Black's "Sprinkles and Smiles" set. The card has no dimension, and I love the look of it. It's a favorite of mine. So that's a total of 69 Christmas cards. I've loaded pictures of them on Flickr, and you can see them at this link. Speaking of numbers, I keep track of the cards I sent, just for fun. In 2015, it was a total of 384. It doesn't seem like that many.